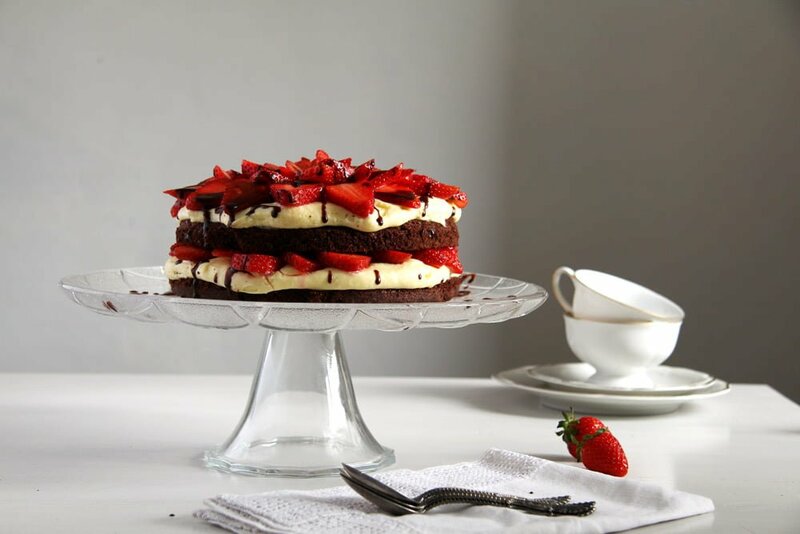 An amazingly decadent strawberry torte with a brownie base and a luscious filling made with vanilla pudding, sweetened condensed milk and cream. Secret Recipe Club time again and this time I was assigned Loving Life, a blog about Kirstin’s life where she posts not only recipes, but as she says it herself – whatever goes through her mind. Kirstin lives in Washington State and has two beautiful, almost grown-up daughters. She’s been blogging for almost 9 years now, so you can imagine, there is a lot to read on her blog. 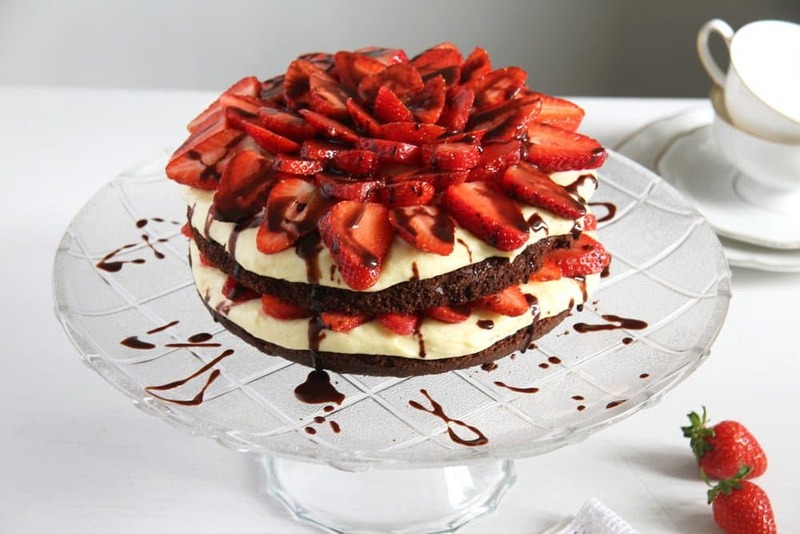 I chose to make her Brownie Strawberry Torte and while searching for a fitting recipe for my strawberry theme, I found many other delicious ones, I have been pinning like crazy. Some of my favorites are the Mozzarella Sticks, Homemade Tortillas, Oven Baked Zucchini Fries, Spicy Sesame Udon Noodles with Chicken, Stuffed Bell Peppers , Sticky Chicken and many many more. And what can I tell you about today’s recipe? It is probably one of the best cakes I have made lately. Every single person loved it and it was gone in one go, so to say. My son ate two huge pieces of it in less than 10 minutes and he was reaching for a third one before I stopped him. I changed the recipe a little bit, first of all due to the lack of the original ingredients. I wasn’t sure about the instant vanilla pudding, but I chose something similar I could find here and it worked (thank God, I was a bit worried about that), then I took heavy cream instead of the cool whip, I imagined that would be more or less the same thing. And I didn’t use a brownie mix, I preferred to make one of my quickest and easiest brownie recipes, it doesn’t take much longer to mix the ingredients then it would take to make the cake from the box. I poured some chocolate glaze on top because I’ve made another chocolate glazed cake on the same occasion. It fit the strawberry cake well, but I wouldn’t bother making some extra glaze just for the strawberry cake, it isn’t really necessary. The end result was just amazing and the cake looks so beautiful, it is hard to believe it is so quick and easy to make. Give it a try, you won’t be disappointed! And make sure to check the other Secret Recipe Club links, you will find many delicious recipes, for sure. Grease a 24 cm/ 9 inch round spring form and line the base and the sides with baking paper. Mix together the oil, vanilla extract, sugar and eggs and whisk until well combined. Mix together the flour, baking soda, cocoa powder and salt and add slowly to the wet mixture. Combine well and pour the mixture into the prepared pan. Level the batter and bake for 25 to 30 minutes or until a toothpick inserted comes out with only a few crumbs. Leave the brownie base to cool completely. For the filling mix together the sweetened condensed milk and the cold water in a large bowl. Beat in the instant vanilla pudding according to the package's instructions, I had to beat mine in for only 1 minute. Chill while you whip the heavy cream. Whip the heavy cream until stiff and fold into the pudding mixture. Chill the mixture for about 10 minutes to allow it to thicken a bit. Wash and dry the strawberries very thoroughly then slice them. Cut the brownie base horizontally, using a long, jagged knife, to obtain two slices. Place one slice on a cake platter. Spread half of the filling and some of the sliced strawberries on top. Place the second brownie slice on top, press gently and top with the rest of the filling. 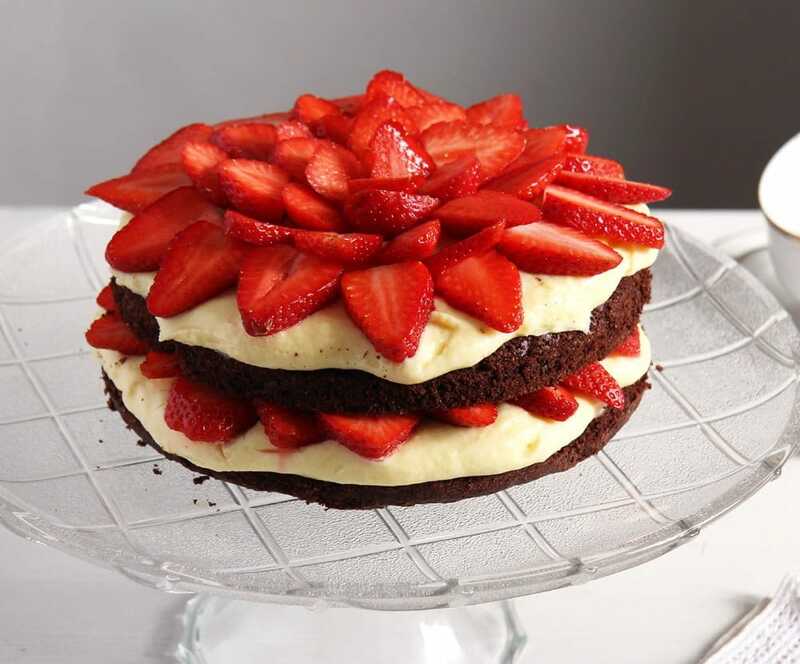 Arrange the remaining strawberries on top. Drizzle with some chocolate glaze, if using any. 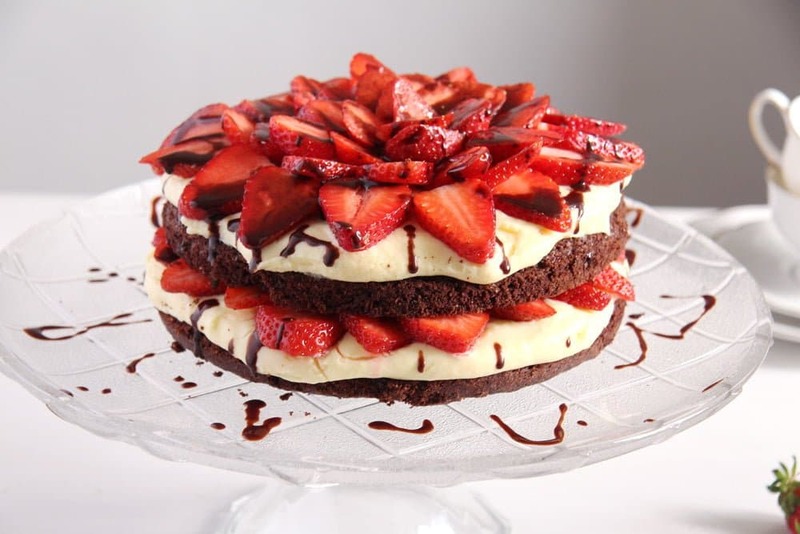 I used 1 package Dr Oetker Galletta Instant Cremepulver for 500 ml milk. Thank you for the nice words, Rafeeda. But I would say this cake looks more complicated than it actually is, everything went quite fast and was really no-fuss. It’s the first time I hear about the Secret Recipe Club and it sounds interesting. I will apply these days, after I’ll change a few things to my blog. This looks awesome! So pretty and very tasty. Nice SRC pick! Yay! Glad you chose it and glad you all liked it, it’s one of our favorites. I haven’t made it in awhile. 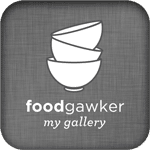 I chuckled because you were saying you had to change some ingredients, etc….I had a blog from an aussie gal and struggled with a few recipes/ingredients/measurements, because of conversions or not knowing or having access to certain things. Glad you were able to improvise and it looks so good I might try your version 🙂 I made a dessert yesterday that called for instant pudding but in trying to avoid processed stuff as much as possible, made my own. It turned out good. I’ll be trying your version of this recipe this summer. Thank you, Dawn. You should check the other recipes too, I think this month there were several brownies on the list. That is just GORGEOUS!! Perfect treat for summer berries. What a gorgeous summer cake! And such a beautiful presentation. I find the filling particularly interesting: it sounds creamy but fresh and not too fatty (not like old-fashioned butter creams…). I’m with you concerning butter cream, not really my thing, a little bit it’s ok, but I could never eat it in this quantity. This is a stunner! 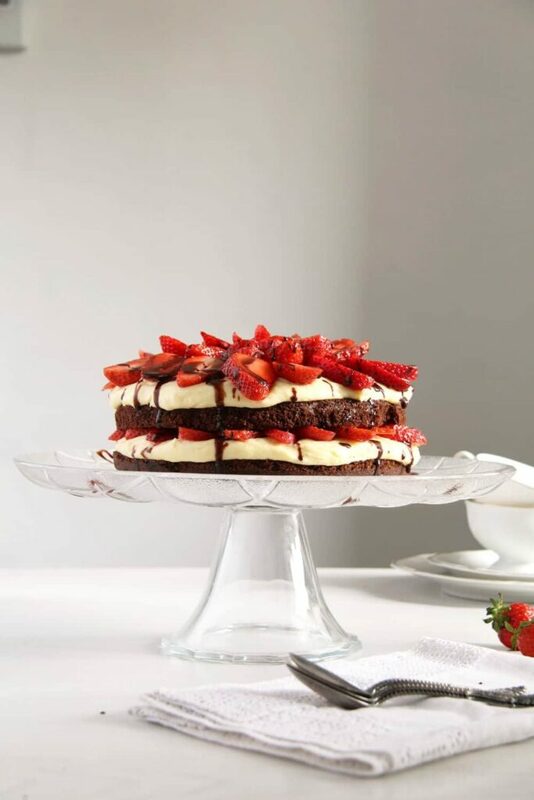 I Brownie, sweet creamy pudding filling and juicy sweet berries…just irresistible. 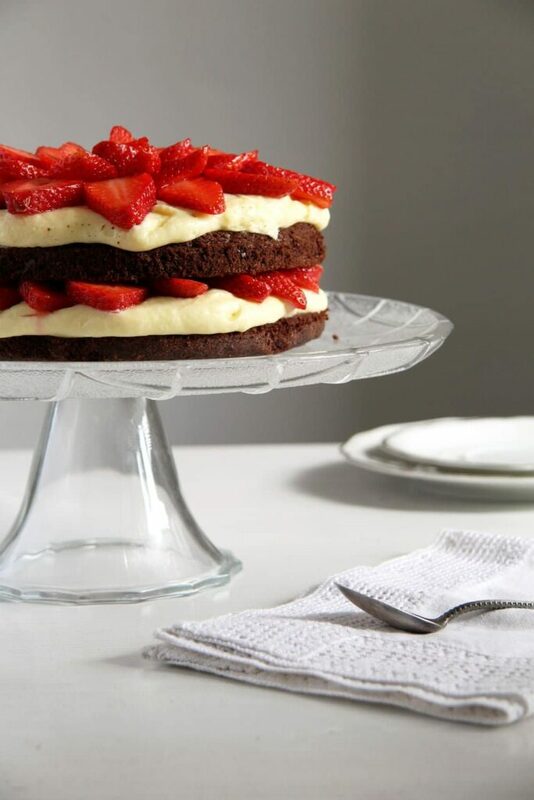 This Brownie Torte looks divine! Wonderful SRC post. I am drooling over this – it looks delicious! Such a beautiful torte! That filling with condensed milk sounds incredible! Thank you, Tara. I love condensed milk, it’s not exactly healthy but it tastes so good. It looks amazing!! Plus you can’t go wrong with chocolate and strawberries. Yum! Oh my goodness! I just love this! Brownies are one of my favorite desserts….and you just made it even better!